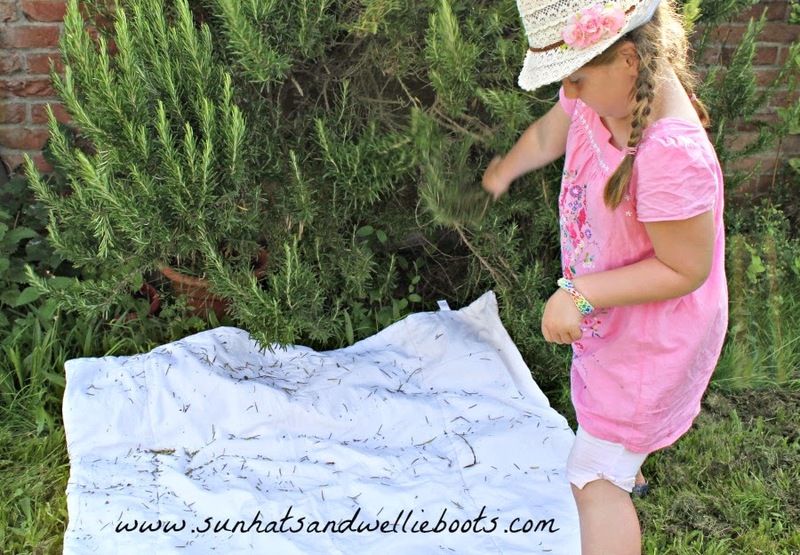 Sun Hats & Wellie Boots: Exploring Bugs & Rosemary Beetles with a Sheet & Shrub Shake! Exploring Bugs & Rosemary Beetles with a Sheet & Shrub Shake! 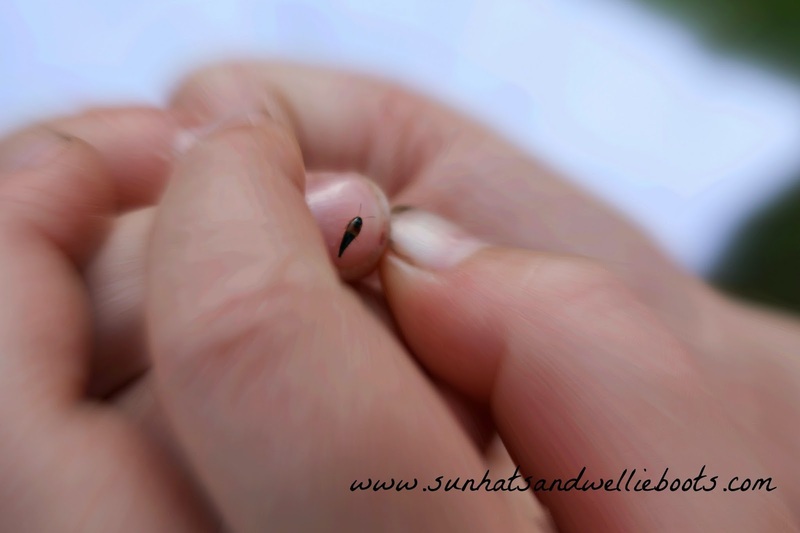 We love going on bug hunts around our neighbourhood & discovering the variety of insects hidden nearby. After a conversation the other day about the bugs around our garden Minnie was keen to see if any were living in the large rosemary bush near our door. I recently read that rosemary repels a number of insects (especially those which are harmful to vegetable plants) so I was interested to see which bugs, if any, we would find sheltering in the plant. To collect the bugs we shook a few of the branches & soon we had a collection of wild finds. 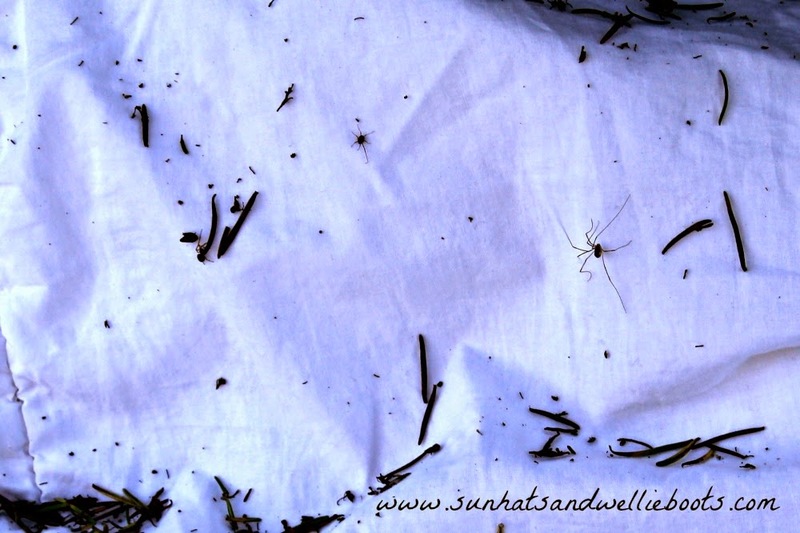 Amongst the dry rosemary leaves which fell we found three different types of spiders & a small variety of tiny bugs too small to photograph but great to study under our magnifying glass. It's really useful to have an insect book nearby too to help identify all your finds. 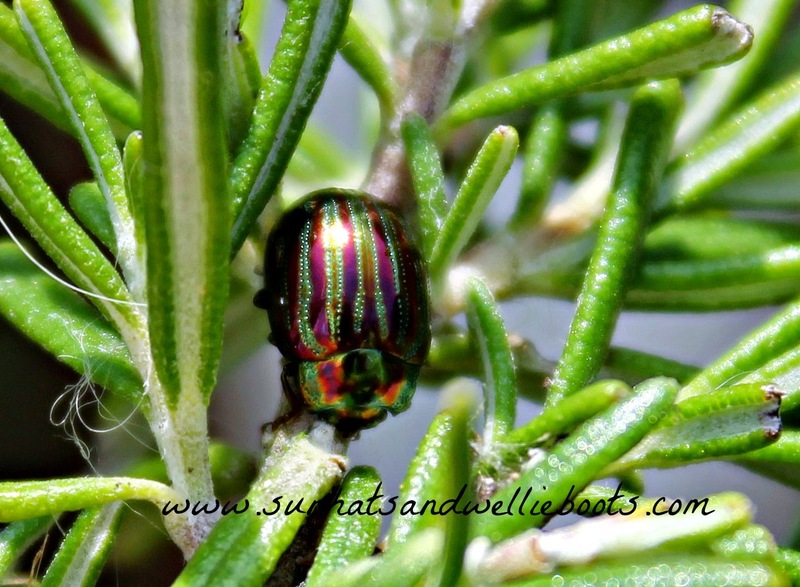 The bug which caused the most excitement was this beautiful green & purple metallic coloured Rosemary Beetle which is commonly found in fragrant plants such as rosemary, lavender, thyme & sage. As the sunlight caught its wing case we couldn't take our eyes away from its vibrant colours & amazing patterns. Although this bug is classed as a 'pest' by gardeners as it eats its way through foliage & flowers we were captivated by its design & Minnie loved observing it close up as it crawled over her hands. 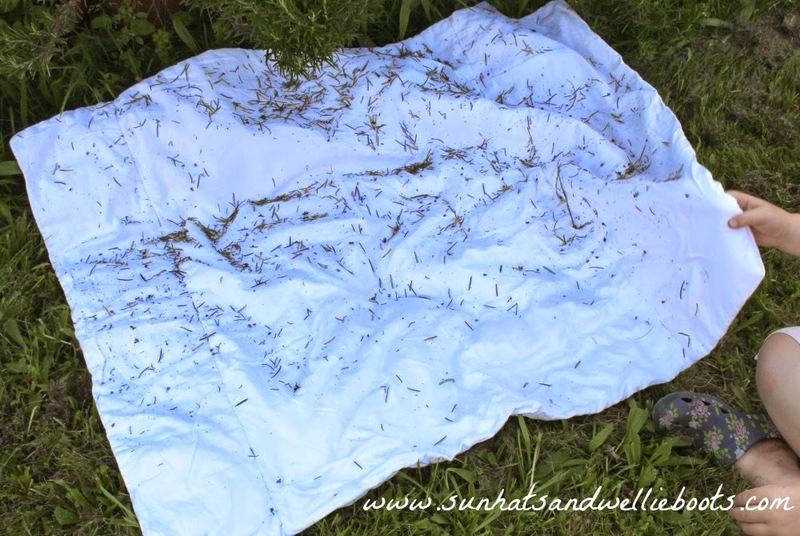 After studying our finds we carefully tipped the sheet & then gently shook it next to the rosemary so the insects could land nearby. We then took a closer look at the plant with our magnifying glass to see if any other bugs were still hidden amongst the leaves & found another Rosemary Beetle. We deduced that it must have pretty strong legs to grip onto the branches so firmly. This simple activity for children of all ages is great for discovering which bugs live on nearby plants, why certain insects are found together, & why certain butterflies, moths & birds can be frequently seen near those plants. We're looking forward to repeating the experiment soon with another of our garden plants & comparing our finds. 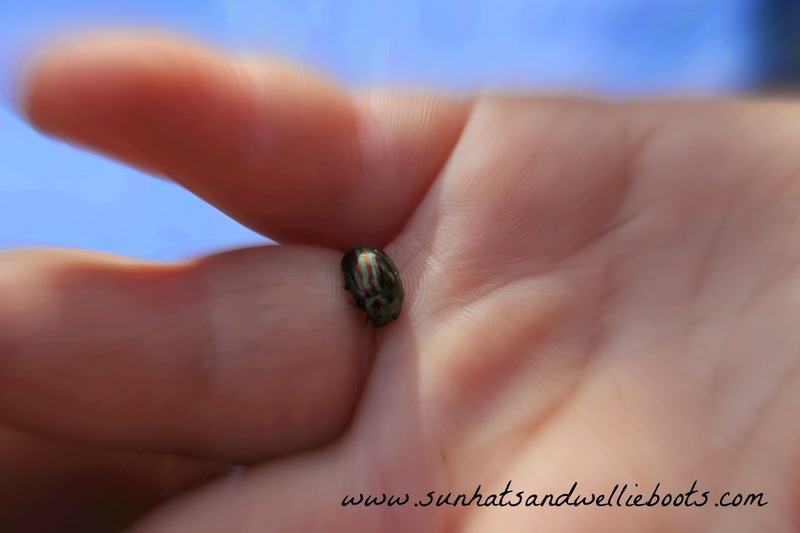 Minibeast Activities, or our 30 Wild Activities for 30 Days Wild.